What we do with what we know. Information exists in two primary places; outside us, and inside us. Some people tend to focus on the “out there information”, what they’ve seen, heard or touched. They seek specific concrete and factual experiences. You could call them “sensors” since they get information through their five senses..
Others find the information “inside” based on their experience, knowledge, and insights. With minimal external influence, these people dive inside themselves, and start looking for possibilities, meanings, relationships, and patterns. They’re more interested in “what does it mean” than “what”. These people could be called “intuitors”, since their intuition guides their actions, rather than data. The disconnect happens when “sensors” and “intuitors” try to share information. A sensor asks a question expecting to get specific data points, and instead gets a rambling (to the “sensor”) discussion of patterns and possibilities. Instead of a general idea and pattern of information, the intuitor hears a flood of boring minutia leaving the requestor wondering what the other is blathering about. To reconnect, a sensor can ask “what have you seen, heard or experienced that leads you to this conclusion?” Intuitors could ask “what does all this data mean?” Even better is to know yourself – whether you’re an intuitor or sensor, and what the other person is. This enables you to respond to the other person’s style. You can practice being the other type. If you tend towards “intuiting”, try to notice several “out there” things every day. Carry with a small notepad at all times and jot down your observations, for example, a dirty brown-and-white dog sleeping in the street; a programming error that prints out the message, ‘RANK ERROR,’ then crashes Windows; a tall young woman in the next cubicle wearing Jovan perfume, making the noise of sharpening a gross of pencils. Sensors can periodically pause and ask questions about the data in front of them. Is Jack’s current coding difficulty related to Jill being on vacation? It looks like progress is slowing, why? The Rule of Three encourages having at least three possible choices before selecting one. Use your imagination and explore beyond the first obvious answer. We store information internally in our mind as sights, sounds, feelings, or abstract concepts. The way we store information is called our representational (rep) system, since that is how we “re”present our experiences. Take a moment and think back to a particularly enjoyable experience you’ve had a work. What came to mind? Did you see your teammates, maybe a particularly gnarly chunk of code you to which you finally saw the answer? Were there sounds of laughter and joking? Maybe you recalled feelings of happiness? If you primarily saw the enjoyable experience, you use a visual rep system. Recalling memories and hearing sounds involves the auditory rep system. Primarily noticing the feelings (touching) means the kinesthetic rep system is being used. Remembering abstract concepts (the lack of visual, auditory, or kinesthetic descriptions) indicates a preference for the digital rep system. Like most preferences, no rep system is better than another. They’re simply the way the way we tend to store and recall our experiences. We can (and usually do) use all of the rep systems, but most people have a preferred way of representing what’s in their mind. To reconnect, listen for sensory words. When words appear like bright, clear, display, see, conceal, the speaker has a visual orientation. When you hear words like asked, talk, explain, complain, harmonize the speaker has overtones of a hearing orientation. Feeling words such as touch, soft, smooth, pressure or excitement slipping into the conversation push towards a kinesthetic, or touch preference. When you become aware of words like believe, consider, decide, know, learn, process, perceive, the speaker is using the digital rep system. 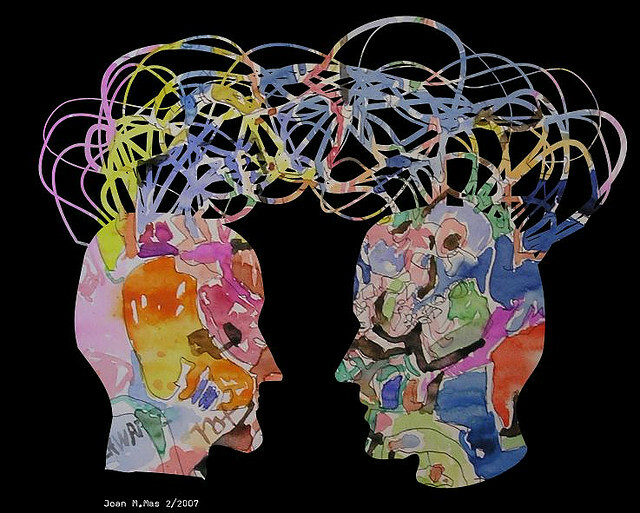 To improve communicating, try to match the sensory mode of the other person. That way they won’t need to translate words from one sensory mode into another. A good time to practice this is when you reply to email. You can scan the incoming message for sensory words, and match the rep system in your reply. You take in the same information I do. You process this information as I would. You come to the same conclusions and decide to behave exactly as I do. In short, I project my reality onto you, and tell you what you’re experiencing. 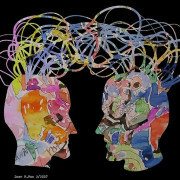 The disconnect happens when we mind read, and then take action without confirming what the other person really thinks. This creates misaligned goals, actions, and often hard feelings. When I work with a client, I first try to understand where they get information. Do they look for data (sensors), or rather hear about how this fits in the grand scheme of things (intuitior)? Sometimes it’s not an either/or. Perhaps they need the fit in the grand scheme with supporting data. When I supply the requested information, I try to match the requestor’s rep system. This saves time and effort since they don’t have to translate my meaning. Lastly, to avoid mind reading, I ask how the communication went for them. Did they get what they needed, in the format they could use? If not, I have new information that allows me to change what I’m doing. If they got what they needed, I’ve avoided the communication disconnects.